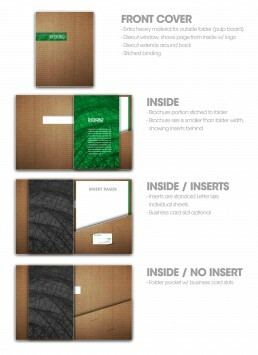 An inside look at a mock design created for an Integro corporate folder/brochure project. The outside folder material would be an unfinished/recycled board material. The folder cover would be diecut to allow the logo to be visible from the inside pages. The inside would feature a saddle-stitched brochure about Integro, a pocket folder for materials, and a business card slot. I handled the concept through completed design.